First Community offers a wide variety of small groups for you to plug into. We have groups open to men and women, women’s studies, and a men’s Bible study meeting throughout the year, both at the church and in members’ homes. 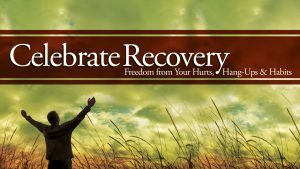 The purpose of Celebrate Recovery is to fellowship and celebrate God’s healing power in our lives through the 8 recovery principles found in the Beatitudes and Christ-centered 12 Steps. The Port Orford chapter of CR uses our church facility every Saturday night from 6:00-8:30 p.m. (meal @ 6:00-6:30 p.m. – meeting @ 6:30-8:30 p.m.) For more information about Celebrate Recovery visit their website at celebraterecovery.com. The last Sunday of each month following the worship service.